AutoCAD LT version Link At Bottom of Page. It doesn’t get any easier than this! Draw Steel Bar Joists & Joist Girders Elevations in 2D by simply picking 2 points. Need 3D, create a bar joist as a 3D-Solid by selecting a single line. No data manuals to find and look up the dimensional information you need to draw a steel bar joist in AutoCAD. 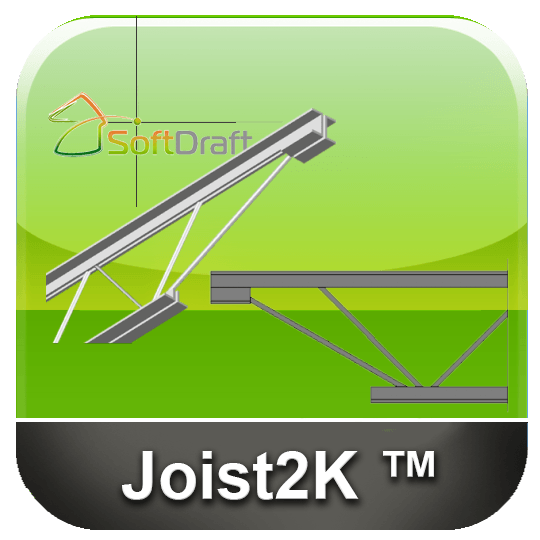 Create joists in 2D for details or 3D for presentations. Add Steel Bar joist to your Wall Sections in less than 30 seconds. Easily place Steel Bar Joist and Girders by selecting two points in your drawing. Creates Steel Joist K, VS, LH, DLH Series and Joist Girders. Draw full length Bar Joists for Building Sections. Options for Top and bottom chord extensions. Add 3D Bar Joist and Girders simply by selecting a single line. Steel Joist & Girder Series module includes the K, VS, LH and DLH Series and Joist Girders. This series is based on the Vulcraft open web steel joist manual, and has greatly enhanced the capabilities of this module. Draw 2D bar joists and girders in plan, section, elevation (for details) and or the complete joist for building sections. You control end extensions, rotation, layer, color and linetype of all joists. Joists are created parametrically and joist in section view are made into an AutoCAD block to allow easier editing and arraying. When placing a joist in section view you are prompted for the joist array spacing to the right of the first joist placement. Special programs aid in placement and notation of joists arrays in plan view. Drawing a 2D Bar Joist in Elevation View is Easy. Just Select Two Points! Be sure to watch the video below demonstrating this. Download the file from the link provided in the sales receipt and save the file to your computer hard disk. After downloading locate the file and execute it to install the program. Restart AutoCAD for the plug-in to autoload and become active. An icon will appear in the “Add-Ins” or “Plug-Ins” tab of the Ribbon Panel for this App. The installer that ran when you downloaded this plug-in has already installed the plug-in. You may need to restart the Autodesk product to activate the plug-in. To uninstall this plug-in, click Control Panel > Programs > Programs and Features (Windows 7/8/8.1) or Control Panel > Add or Remove Programs (Windows XP), and uninstall as you would any other application from your system. You have 15-days to activate the software. When running in non-activated mode a dialog will only appear once the first time the program is executed in a new or existing drawing which indicates the number of Days Remaining before the program stops and an option to Activate. Until you are ready to activate the software, you can run the software in the Non-Activated mode before it expires by clicking on the “Continue without Activation” button.